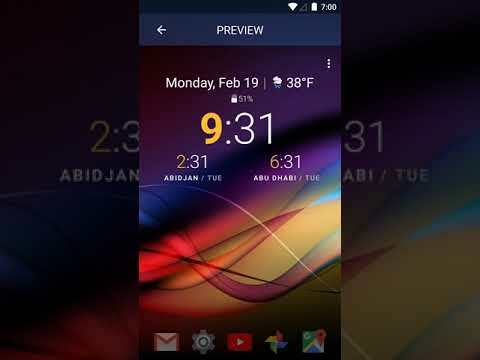 Welcome to Chronus, a set of flexible and stylish Clock, Weather, News, Tasks, Stocks and Calendar widgets for your Home and Lock** screen. All Chronus widgets share the same highly optimized back-end services, making it the perfect, single replacement for many of the other stand-alone widgets on yo... see more Welcome to Chronus, a set of flexible and stylish Clock, Weather, News, Tasks, Stocks and Calendar widgets for your Home and Lock** screen. All Chronus widgets share the same highly optimized back-end services, making it the perfect, single replacement for many of the other stand-alone widgets on your device. This ensures your system will use less CPU, data and battery while still providing you with rich information. While Danny Baumann, Jorge Ruesga and I wrote most of the widget, credit also goes to the many translators as well as other contributors such as Nicolai Ehemann and Matt Booth for the languages and features they have contributed.